I was looking for a very tasty yet simple meal to make for dinner one night, something that would take few ingredients and even less time . 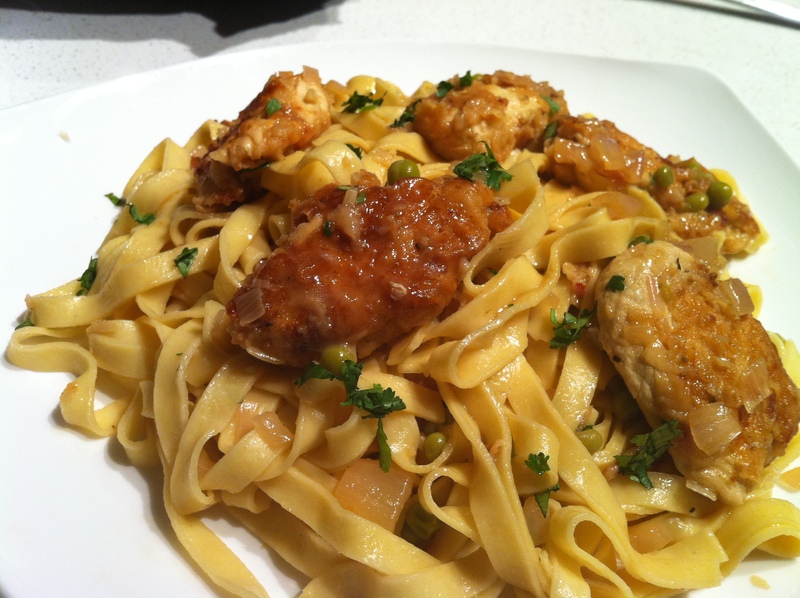 This simple pasta dish is bright with lemon, the chicken fried crispy and the whole dish made my taste buds Pop. It was satisfying, and very damn good. Time to De-Construct this dish! Begin this dish early in the day if preparing for dinner or the night before if preparing for lunch. Clean, rinse and pat dry the chicken and cut into very large chunks, place all the chicken in a bowl just big enough to hold them all. Pour the 3 tablespoons lemon juice, the 1 tablespoon olive oil and the minced garlic over the chicken. Salt and pepper , stir so all the chicken is coated in the liquid, then cover the bowl with plastic wrap and place in the refrigerator to marinate all day, overnight or at least for several hours. The chicken marinated like this will not only be infused with lemon flavor but once cooked it will be tender and moist. Once the chicken has marinated, take the bowl out of the fridge and remove the chicken pieces from the marinade. Start a pot with water for the pasta. Salt the water once it comes to a boil. Heat up about 2 tablespoons olive oil in a large skillet. Toss the chicken pieces in the seasoned flour to coat then shake off the excess flour. Once the oil is hot, add the chicken (you may need to do this in batches as you do no want to crowd them) and allow to cook until the pan side is golden brown and crispy. Turn the pieces over to brown on the other side. Add more olive oil to the pan as needed. As the chicken pieces turn golden brown all over, remove them to a plate. Cook your pasta in the salted boiling water as you prepare the chicken and sauce. Keep watch over it and drain it when it is done. Place it in a large serving bowl. Once all of the chicken is browned, quickly wipe out the skillet with paper towels then add a couple more tablespoons of olive oil to the hot skillet. Add the chopped shallots and garlic and, stirring cook them until they are wilted, tender and caramelizing around the edges, about 2 or 3 minutes. Pour the chicken stock and juice of one lemon over the cooked shallots and garlic. Salt and pepper. Add the peas and lower the heat to allow the broth to simmer for a few minutes until the peas are cooked and tender and the broth and juice are reduced to about half. Carefully add the chicken pieces to the broth just to heat through. Pour the sauce with the peas and chicken over the cooked pasta and toss gently so the pasta is sauced and the chicken and peas are evenly distributed. Sprinkle the chopped fresh cilantro or parsley over the top to toss as you serve. Posted on August 17, 2011, in Poultry. Bookmark the permalink. 4 Comments.